Given the Trex® reputation for long-lasting and beautiful outdoor products, it only made sense to delve into creating solutions for outdoor kitchens, cabinetry and storage. As a result, we’ve come up with a product that is stunningly beautiful, but also ruggedly functional. 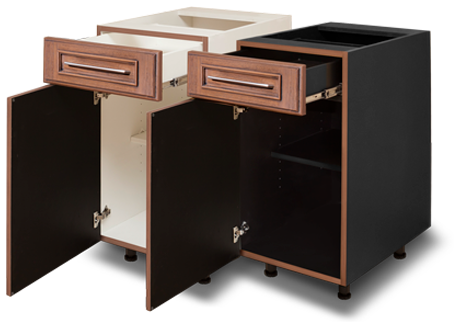 Our cabinets are constructed out of 3/4” thick white or black PVC and feature 100% stainless steel hardware. On top of that, we’ve pioneered a closed-cell weatherproof resin that we’ve molded to create exterior beauty that you will love at first sight. Available in our captivating Cayman door style and 5 colors that complement the Trex Transcend® premium tropical series. These cabinets are designed to blend seamlessly into your deck, providing comfort, beauty and longevity to your outdoor life. Because we trust the product we’ve created, we’re also offering a 25-year Limited Warranty against natural wear and tear ensuring you enjoy many years with your Trex® Outdoor Kitchens™ products. Polyvinyl Chloride, or PVC, is a man-made polymer that has seen use in a multitude of applications from food to medicine, indoor to outdoors. In the cabinet industry, it’s a groundbreaking method of weatherproof construction. PVC is a robust yet light-weight plastic with properties that allow for its use with outdoor cooking appliances. Our cabinet and drawer boxes are built from 100% waterproof PVC which is assembled using a weld-like bonding process that creates the strongest cabinet box on the market. We offer white or black PVC cabinetry that absorbs little in the way of heat and light. Our cabinetry is easy to clean – simply spray it with a hose and wipe it down to dry. The combination of durability and aesthetics makes Trex® Outdoor Kitchens™ Cabinetry and Storage one of the best values in the outdoor living market. Resin, a polymer used in the creation of our Trex® Outdoor Kitchen™ products, is a light-weight foam that’s injected into a die, pressed down with considerable force, compressing the cell-like structure of the foam into a dense and strong material. The combination of resin with PVC in our products makes for stellar results against the elements. We also style the inside of the die to look like real wood and, once finished, you have a beautiful, realistic product. All Trex® Outdoor Kitchens™ doors, drawer fronts, panels and planks are created from molds made from real distressed Teak wood to give an amazing natural grain detail.